Let’s look at little deeper at the death of Prince yesterday. It’s clear from TMZ that this was an OD death. I have the event time when 911 was called as the inside chart and Prince’s natal on the outside. It’s always handy to swap these charts because the event chart can give extra info from a different perspective. 911 was called at 9:43 am with 2 Cancer on the Asc which puts Prince’s nMars right on the EQ 10th cusp! And that Event Asc goes into Prince’s 8th house. 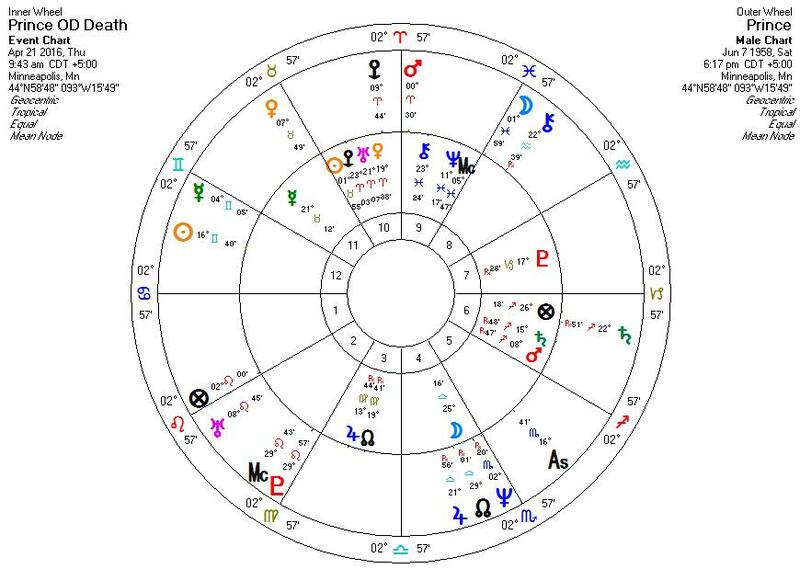 Yes it was an accidental OD but more than likely it was a woman that found him with Cancer on the Asc and Moon in Libra almost exactly opposing tEris, Uranus, Venus in Aries. The tSun had just entered Taurus to oppose Prince’s nNeptune at 2 Scorpio. tSaturn has been opposing his Sun for awhile so he was likely depressed and needing money (he was in concert tours). IT is interesting that until tMoon entered Scorpio and conjuncted Prince’s nNeptune it was uncovered that he had a drug problem. A hidden element was his Part of Self was at 16 Gemini (Asc+Asc-Sun) which is also the Venus North Node at 16 Gemini, a strong point for design and music. That tSaturn was creating a T-Square to his nSun and Part of Self. TMZ reported today that Prince made an emergency landing of his plane because of overdosing six days before his death. He was having serious money problems. He made lots of money but he was a bad business manager. He didn’t license his songs, he did impromptu concerts that were serious money losers. So the prior comments I have made have been verified. Prince had hip surgery several years ago and was taking Percocet for constant pain. Now there appears to be the use of cocaine too. Waiting for the autopsy report to confirm. A man called 911 to report Prince was dead.